Check out our Best VPN for Android guide updated for 2019. Android is the most used mobile operating system in the world and with privacy issues regularly being in the news, it means it’s now more important than ever to get yourself a VPN service for your mobile device. But what is the Best VPN for Android in 2018? It seems like an almost impossible question to answer. With so many choices out there, how do you even begin to find the Best VPN for your Android device? This is where we step in. We’ve been testing a whole host of VPN providers to find the very best for use with Android in 2018. All that you need to do is select one of the five recommended providers below and enjoy protecting the privacy of your Android device. If you’re looking for the Best VPN for Android and you want a good VPN service to go with it then IPVanish should be your first choice. They’re our Number 1 VPN service for 2018 which we especially commended them for their fast download speeds and no-logging policy. Unlike other providers IPVanish doesn’t log any of your activity nor do they log any metadata either such as your connection times or IP addresses. Most VPN providers do log this so it’s an added layer of privacy. The IPVanish Android app is one of the easiest to use and while it may not look quite as cutesy as some other providers, it is extremely beginner friendly. You can basically just click Connect and let it do its work or if you need further customisation then selecting countries, cities and even individual servers can all be done from the main app screen. We had no issues moving from Wi-Fi to mobile data connections and the app seamlessly picked up connection. If you’re looking for good design in your Android VPN app then NordVPN is worth a look. Their Android app is one of the best designed and mirrors their desktop clients so if you’ve already used or are planning on using the desktop client as well then the process is seamless between the two. The Android app doesn’t have a whole host of features which is great if you’re a beginner or just want to connect to a server. If you’re an advanced user then you’ll probably miss features. That said, there is the possibility of using the CyberSec service from NordVPN which will protect your Android device from malware, phishing and other threats while connected to their Android app. It’s also possible to make use of obfuscated servers which will let you bypass restrictive networks or censored internet access. 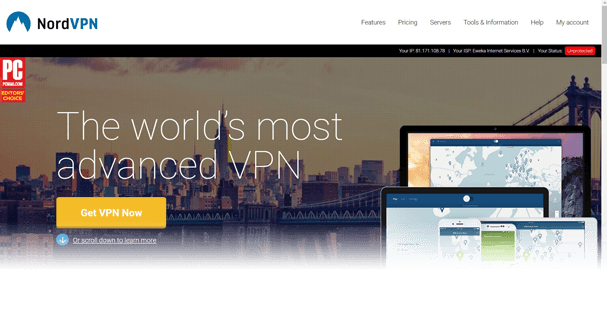 We really liked the fact NordVPN have dedicated servers for specific purposes such as P2P, Double-Hop VPN, Anti-DDoS and more which are all accessible from the Android VPN app. We haven’t seen VPN.ac on any other Best VPN for Android list and we’re really perplexed why not. They offer one of the best VPN services we’ve seen and their Android app is pretty neat too. They launched a brand new Android app in the middle of 2017 after having as slightly clunky app in the past. Although VPN.ac has some advanced options for experts, the Android app is now beginner friendly and it’s as simple as choosing a server from the main app screen and flicking the connect switch. Although the VPN.ac Android app is simple enough for beginners to use it also has some more advanced features that will keep you happy if you’re an advanced user. One of our favourite features of the Android VPN app is the ability to exclude other apps from using the VPN connection. It’s not something we’ve seen on many other apps so it’s a nice little addition. ExpressVPN is one of the largest VPN providers in terms of coverage which is great for your Android device. If you’re a traveller then you probably take your Android based phone or tablet with you. There’s no more important place to protect your connection than when travelling, be it in a hotel, coffee shop or other open Wi-Fi network. The service offers VPN connection points in over 94 countries across the globe giving one of the largest coverage in the industry. Although ExpressVPN cost a little bit more than other providers they do have a wider range of locations. The Android app is extremely easy to use. If you want you can just press the connect button and let the app do its work, alternatively you can select a specific location which is broken down into an easy to navigate manner. The Android VPN app is very sparse on features but connecting is easy and if you want nothing more than to protect your privacy, bypass censorship or access blocked media content then it’s really easy to use. CyberGhost VPN has come on leaps and bounds in recent years making their first appearance in our Best VPN for Android 2018 guide. Their continued server expansion now makes them as good as the competition and with servers in over 51 countries they’re good for using your Android device almost anywhere in the world. The Android app is easy enough to use and is great if you’re new to VPN use as it helps you connect quickly on either your phone or tablet. We really liked the fact you can block harmful content while connected to the service and the option to compress data so when using mobile data you can save your transfer limit and optimise your downloads. The service can be used across 5 different devices and there’s a lengthy 30-day money back guarantee, what’s not to like about that? Choosing a VPN for Android can be difficult. There are more than 1000 VPN providers in existence today and knowing which are good and especially which are good to use with Android can be confusing, time consuming and even expensive. We tested a huge range of services to find you the very best and in this updated guide you can be sure that they’re working well with Android in 2018. It’s important that you consult up to date guides such as this for 2018 to ensure that the service you sign up is still relevant for use with Android. With outdated information it may be the case that a provider was good in 2017 or before but is no longer as good in 2018. All you really need to do is choose one of the five above. We recommend IPVanish but if you have more time it’s worth checking all five out and then choosing the one that suits your individual needs. Not at all. We’ve purposely selected VPN providers that are quick and easy to use. Once you’ve signed up to one of the five recommended providers all you need to do is visit the Google Play Store and download the correct app for the service you signed up for. Once installed it’s simply a case of selecting a server location and pressing connect. The app does all the hard work and once connected you’re free to browse the internet on your Android device without restriction. As long as your mobile or tablet can access the Google Play Store to install the VPN app from your provider then you’ll be able to use a VPN service without issue. If you’ve got an Android box or other TV connected Android device then the process should be the same. If you can’t connect to the Google Play Store then some VPN providers such as IPVanish and ExpressVPN allow you to download their Android apk app directly allowing you to install outside the Google Play Store. In 99% of cases an Android VPN will allow you to use apps that are restricted to specific regions. For example, if you want to use BBC iPlayer outside the UK then you can simply connect to a UK Server on a VPN service that works with iPlayer such as NordVPN and then stream content in any country. In very rare cases the mobile app will require you to enable location services which would render the VPN useless, but this is extremely rare and we haven’t experienced this on more than 1 app worldwide. If you only have a need for an Android VPN for a short time then it’s probably best to sign up just for a month. This will be useful if you’re popping off on holiday for a short period of time and will allow you to protect your privacy and access home TV content while travelling. For all other needs it’s best to consider signing up for a year. Yearly packages can be over 50% cheaper than paying monthly and as privacy issues aren’t going to go away anytime soon in 2018 you’ll make a big saving while protecting your privacy. There’s also the possibility of streaming blocked TV content from around the world on your Android device giving you even more viewing choice. We know choosing a VPN in 2018 can be confusing which is why we’ve put together this guide. In 2018 a VPN is an essential tool for your Android device as more and more of us use our mobile devices on insecure Wi-Fi networks and are at risk of having our privacy violated even when using mobile data. All you need to do to protect your device is select one of the five VPN services above. It really doesn’t matter which you choose because we’ve tested them all and can verify they work well with Android mobile and tablet devices and even with Android TV boxes. If you want to protect your privacy, bypass censorship and access blocked TV content then we recommend getting an Android VPN for your device today.